A parent with Alzheimer’s. A sick child. A bad break-up. Loneliness. A frightening diagnosis. Depression. Infertility. Anxiety. A babysitter who didn’t show up. A wedding to plan. House guests. A friend battling addiction. An old dog. Insomnia. Stress. Money troubles. I bet you’ve got someone on your staff dealing with or suffering from one or more of the above. I’ve been meaning to share these thoughts about taking time to find out what’s going on with someone before judging them too harshly, and just read a wonderful Thrive Global blog post that says it all better than I can. The post has some wonderful quotes and a powerful excerpt from Dr. Stephen Covey’s The 7 Habits of Highly Effective People. You may be familiar with the story about Covey approaching a father of two boys behaving badly on a train and asking him to better control his sons. The father acknowledges that he probably ought to do something and goes on to explain that they’ve all just come from the hospital where his wife, the mother of his boys, has just died. Speechless, right? There’s a similar story with a parking twist, called Parking Lesson, that just appeared in the Metropolitan Diary section of the New York Times. 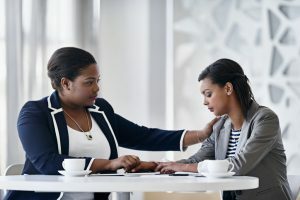 Part of compassionate living is realizing many of us are trying our best against everything from small to insurmountable challenges–and a little compassion can go a long way. Helen Sullivan, APR, Fellow PRSA, is IPI’s communications counsel.